Sika has acquired L.M. 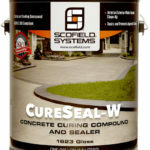 Scofield, a US-based market leader in the production of concrete color additives for ready-mixed concrete, along with decorative products and treatments for concrete refurbishment. Scofield offers a comprehensive range of color solutions to serve customers in the fast-growing decorative concrete market of North America, and generated sales of CHF 17 million in 2015. The name L.M. Scofield Company represents the oldest and one of the most trusted manufacturers in the business of Decorative Concrete Manufacturing. 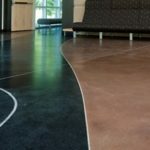 This recognition comes from more than 90 years in the industry, creating high standards for products that form a virtually unlimited menu for coloring and texturing concrete. 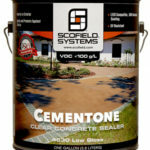 Salmon Bay sells Scofield LITHOCHROME® Chemstain® Classic and LITHOCHROME® Tintura™ Stain. 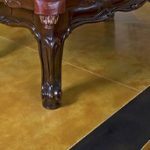 LITHOCHROME Chemstain Classic is the ready-to-use, penetrating, reactive stain that chemically reacts with the surface of cured concrete to produce unique and permanent color effects. Chemstain can be applied full strength, blended or diluted for a multitude of creative color effects. LITHOCHROME Tintura is a high-performance, self-priming, low-odor reactive polymer stain for coloring concrete surfaces. It is designed for use as a primer/basecoat beneath clear solvent or waterborne acrylic, urethane or epoxy sealers. Tintura is VOC compliant in all jurisdictions of the United States. Lithochrome Color hardener is a ready-to-use, powdered dry-shake hardener used to add color into the surface of freshly placed concrete. It produces a hard, long-wearing, abrasion-resistant surface. Color-hardened concrete has improved resistance to the effects of freeze-/thaw cycles and de-icing salts. It is ideal for pedestrian or vehicular traffic both indoors or out. **See color selection chart LITHOCHROME Color Hardener A-132. Custom colors can be ordered. Residential projects: Two applications which total 50 lbs/100 ft2. One package. Commercial projects: Two to three applications which total 90 lbs/100 ft2. Light colors require: Two to three applications which total 90-120 lbs/100 ft2. Heavy duty uses require: Three applications which total 120 lbs/100 ft2. In conjunction with imprinted concrete. When a lighter or brighter concrete color is desired. When a bold color is desired. On interior new concrete when a more monochromatic appearance is desired. Cannot be used over cementitious toppings. Determine the amount of material needed. Broadcast material onto the surface by hand or with a mechanical spreader. Floating should be done with a wood float, so that the surface remains open and the material gets fully worked in. Broadcast evenly onto the surface. Work in with wood bull float. Use more finishers than you would on regular gray concrete. Choose from eight distinctive colors of Scofield’s LITHOCHROME® Color Hardener, available at Salmon Bay. Scofield Liquid Release BG is a low-cost bubble gum scented release and bond breaker for use in the concrete stamping process. Application of Liquid Release BG to the concrete surface and stamps prior to stamping will prevent the transfer of the wet paste to the stamping mat. It may also be applied to tools to prevent them from marring patterns in fresh concrete and may be used when stamping or texturing cementitious overlays. Liquid Release BG will not damage integrally colored concrete and is suitable for use with most color hardeners. 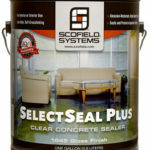 It will evaporate completely, leaving no residue, and will not interfere with the application of solvent-borne sealers. Liquid Release BG is not intended for use as a bond breaker for tilt-up construction. 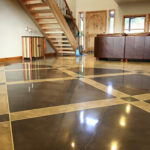 Apply over fresh concrete or overlays that will be imprinted with stamping tools. Concrete Surface: 200 sf per gallon. Stone Gray, Walnut, Pecan Tan, Classic Gray and Deep Charcoal. LITHOCHROME® Antiquing Release is an odorless, high-performance, colored, powder stamp tool release. Use it to improve the ease of separating concrete stamp tools, embossing skins or texturing tools from the freshly placed concrete or cementitious materials they imprint. LITHOCHROME Antiquing Release adds variegated color to the imprint, and can increase the perceived depth of stamp patterns. Apply LITHOCHROME Antiquing Release to the entire surface to be textured immediately prior to stamping. Its hydrophobic nature will help prevent the wet cementitious material from sticking to the pattern tool, and improve print quality. Antiquing Release application requires the 6 steps of Broadcasting,Stamping, Standing, Excess Removal, Curing, and Sealing. The careful timing of each step, and repeatedly using a single application technique,is important to develop consistent results. Application to younger more plastic concrete will embed more of the release into the surface and will result in more significant color effect. Stamping more fully cured concrete will embed less color. Timing will be influenced by temperature and humidity conditions. 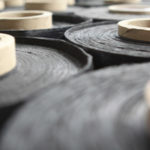 material to be stamped and the imprinting tool. Choose from a variety of colors found on Scofield’s CHROMIX® Admixtures for Color-Conditioned® Concrete, and LITHOCHROME Color Hardener.